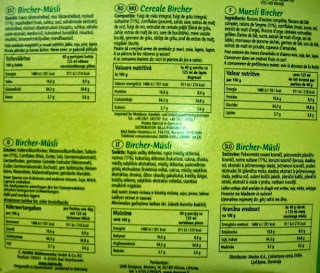 To help ensure that foods are safe for eating, many countries require packaged foods to be labeled, and the format is similar for most of them. For example, this clear run-down, from a Canadian blog, on the contents of nutrition labels easily applies to labels in many countries. In the early 1900s, before laws and labeling, filthy conditions in meat-packing plants, foods containing poisonous preservatives and dyes, and "cure-all claims for worthless and dangerous patent medicines" led the U.S. Congress to pass initial food and drug safety laws. 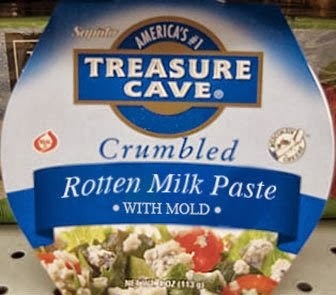 In fact, the U.S. finally standardized its food labeling as recently as 1990 (!! 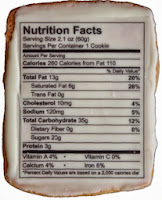 ), when new legislation required all packaged foods to display nutrition labeling. 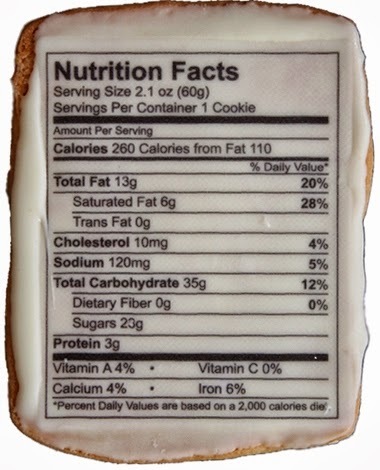 It also standardized the food ingredient panel, serving sizes, and terms such as "low fat" and "light." 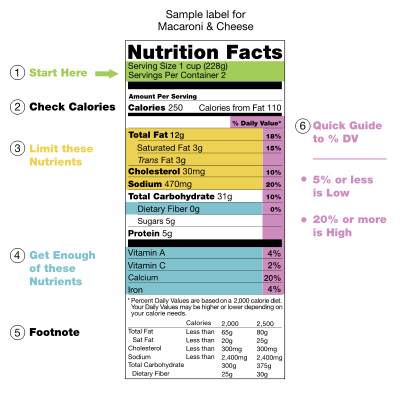 Full nutrition labels show the standard serving size, number of calories per serving (no, not for the whole box...), and amounts of some 13-15 core nutrients. In the U.S., total fat, sodium, carbohydrates and protein must be shown, regardless of the amount. These 11 additional nutrients are usually shown but may be left out if they are zero: total calories, calories from fat, saturated fat, trans fat, cholesterol, dietary fiber, sugars, vitamin A, vitamin C, calcium, and iron. 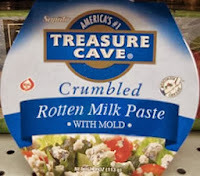 The label is required for most prepared foods, including breads, cereals, canned and frozen foods, snacks, desserts, drinks, and, more recently in the U.S., chopped raw meat. 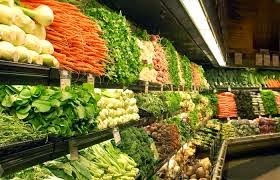 In the U.S., labels are not required for raw fruits, vegetables, and fish. In Canada, raw meats are also voluntary. Some countries also label non-nutritional products, such as alcohol, coffee, and tea. Cholesterol Free = Less than 2 milligrams of cholesterol and 2 grams (or less) of saturated fat per serving. 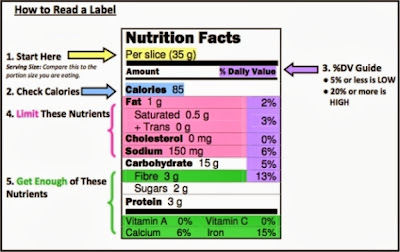 If you've been trying to consume fewer calories or limited amounts of sugar, sodium, or fat, or if you want to increase your intake of vitamins or fiber, you may already know how to read at least key parts of the food label. 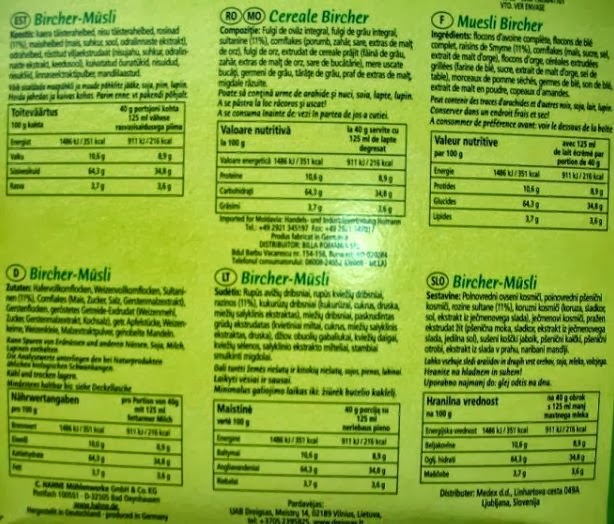 The ingredient list, which lists the ingredients in descending order by weight, is equally important for anyone trying to avoid certain food items (e.g. 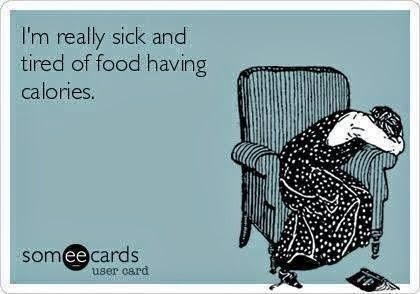 peanuts, shellfish, gluten) or cut back on fat or sugar (keep sucrose, or glucose, or high-fructose corn syrup, etc. near the bottom of the list!). And, for a chuckle, some more truth in food labels at College Humor. The best fitness pills always help you to get the best body fitness without doing any hard work out or using the diet plan, from this summitgym.net/ everyone can get the best fitness drugs for them which can help them to improve their body fitness and health.